Developed in conjunction with The National History Museum, learn fun facts about Dinosaurs while helping develop memory. Fascinating dinosaur facts for memory training. Do you know your Tyrannosaurus from your Triceratops? Or which Dinosaur’s name means “Heavy Claw”? 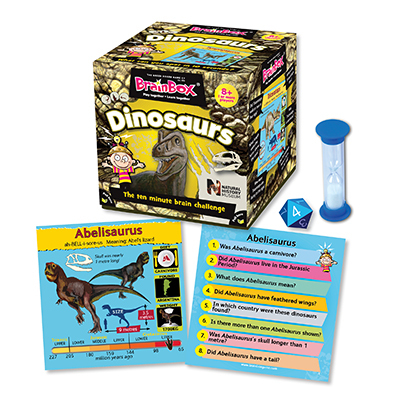 Developed in conjunction with The Natural History Museum, BrainBox Dinosaurs includes fun facts about the most fearsome and best-loved creatures that have lived on Earth. The object of the game is to study a card for 10 seconds and then answer a question based on the roll of a die. If the question is answered correctly, the card is kept and the person with the most number of cards after 5 or 10 minutes is the winner. This simple concept can be played by all ages and in large groups as well as a 1 person game. Made from a minimum of 70% recycled material, the BrainBox range is fabulous fun. Find out who the BrainBox is in your family – it may not be who you think it is! Brainbox games are a great visual resource, are fun to play, and are effective for developing working memory.